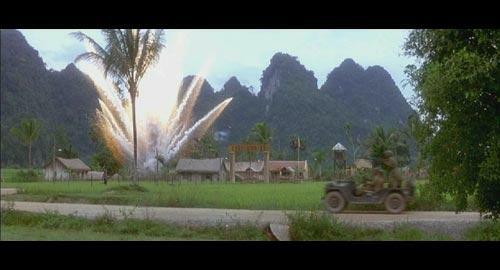 Heaven and Earth completes Oliver Stone's three movie examination of the Vietnam war and those it touched. The three films I'm referring to are: Platoon, Born On The Fourth Of July and Heaven and Earth. In Platoon, Stone shows us the horror, pain and confusion of this war. The enemy is almost faceless, the attacks come out of nowhere and confusion reigns. We see men die in a war that was all about politics. They die for nothing. They fight for nothing. The conditions turn some men into vicious, hateful killers and others into junkies. The soldiers turn on one another as discipline fails in the face of confusion about who the enemy really is. In Born On The Fourth Of July we see the post war experiences of injured veteran, Ron Kovic. A man who went to Vietnam a young and idealistic patriot only to return with a shattered body and spirit. He returns to a country that hates the war and seems to hate him. He rides the slippery slope to despair and bitterness but then makes peace with himself and his country as he comes to the realization that he wasn't hated but the war was. In Heaven and Earth we see through different eyes again, in this film we see through the eyes of Le Ly Hayslip a member of a rice farming family in Ky La central Vietnam. Oliver Stone based this screen play on two books, co written by Le Ly, called "When Heaven And Earth Changed Places" and "Child Of War, Women Of Peace" which tell of her experiences. Through Le Ly, we see the most victimized of all, the rural people of Vietnam. These people faced many invaders, saw many wars in their land and suffered terrible hardships, the victims of politics and power struggles. In Le Ly we see a courageous woman who suffered much but somehow managed to go on. The film opens just prior to the war between Viet Minh forces and the French at Dien Bien Phu in 1953. We see the pre-war Ky La in which the people live a happy and peaceful life among the rice paddies in beautiful and tranquil surrounds. All that changes when the French arrive. Their homes are burnt to the ground, people are bashed and killed and some of the women raped. In voice over, Le Ly tells us that during the following year they nearly starved as they struggled to re-build their lives and their homes. The real story of Le Ly begins ten years later with the emergence of the Viet Cong. They visit the village and speak of their anger at the division of Vietnam and the exploitation of the countries resources by foreign parties. They speak of unification, independence and the freedom to farm in peace. This is intoxicating to the Hayslip family and the older sons join the cause and return to the north to begin the offensive. As the conflict grows so does the presence of the American backed South Vietnamese forces. They establish a base nearby and barricade the town against the Viet Cong. Loyal to the Viet Cong, Le Ly helps them by preparing arms, digging bunkers and participating in ambushes. However, her activities are noticed and before long the South Vietnamese army take her to a camp for interrogation. Here she is beaten and tortured on several occasions before her mother bribes some of the guards and she is released. Her troubles are not over however as her early release from the camp raises suspicions among the Viet Cong and before long they also come for her. The very people she helped have now turned on her and she is threatened and then raped. No longer safe, her mother takes her to Saigon where her life is to take another turn. I'm going to stop the plot summary here as I don't want to ruin the story for you. Check out this film as it is beautifully made and gives a different perspective on the Vietnam war. One that you're not likely to find in a western history book. Filmed and presented in an aspect ratio of 2.35:1 this 16x9 enhanced transfer is lovely to watch. The cinematography of Robert Richardson is brilliant and he and Oliver Stone have created a visual feast. Having a great time. Wish you were here. The colours in this transfer are wonderful. The greens of the country are strong and warm without seeming un-natural and other colours such as yellow, orange and red are bright and bold. The black level is excellent and shadow detail is good. This transfer is nice and sharp with many fine details revealed throughout. There are some great old faces in this film, full of character and life and this transfer allows you to see every line. There are some minor examples of Film-To-Video artefacts in this transfer. These take the form of aliasing and moiré effects. These are most clearly seen in slow pans that cover the buildings of Ky La. Film artefacts appear often but are mainly small and not overly distracting. This disc features three audio tracks. Two are Dolby Digital 5.1, one in English and the other in Italian. Both are encoded at 384 Kb/s. The third, a commentary by director Oliver Stone, is a Dolby Digital 2.0 surround encoded track with a bit rate of 192 Kb/s. I listened to the English 5.1 track and the directors commentary. The 5.1 track is very good indeed. It's a wonderfully immersive effort in which all channels are put to good use. You will hear many good examples of directionality as aircraft fly overhead or cars drive from one side to the other. You will also hear many great examples of ambient sounds such as wind and rain. The subwoofer is used to good effect for explosions, thunder and the like without overpowering the other channels. The dialogue of this film is clear at all times and set at levels that match the on-screen action. For example, yelling penetrates the sound of gun fire and explosions but is not un-naturally loud. This film features many actors whose first language is not english and as a result some of their dialogue is a little tricky to understand. I found that the occasional word slipped past me but it didn't reduce my involvement in the film at all. The dialogue remained in sync throughout. The score is wonderful. It contains Asian influences as well as the more traditional orchestral themes common to film scores. Also featured, when Le Ly moves to America, are popular songs from the 60's and 70's. An interesting, well integrated and stirring score to be sure. Students looking for a wealth of film making information should look elsewhere as Stone only occasionally talks about such matters in this commentary. He does reveal interesting information about the difficulties of getting permission to film in Vietnam and how this forced the production to Thailand instead. He also talks about the amount of building and landscaping that had to be done in order to create the village of Ky La. He talks a lot about his adaptation of Le Ly's books and of her in general as well as his own experiences of Vietnam both during and after the war. Stone also discusses the history of the Asian region in depth especially the post world war 2 meddling of the U.S in the governments of the region. For me it was an interesting commentary but also a little disappointing as there wasn't enough information about the making of the actual film. In this section you can view approximately 48 minutes of scenes that were either cut from the final film or alternative cuts of existing scenes. You have the option of listening to them with production sound or with a commentary from Oliver Stone. The video of this section is framed at 2.35:1, like the main feature, but it is not 16x9 enhanced. The quality of the image is ok but the colour is somewhat distorted and the amount of detail merely adequate. The Dolby Digital 2.0 stereo sound is fine. I thought this a nice inclusion especially when watched with the commentary by Stone. Running for approximately 3 minutes, this trailer is framed at 2.35:1 and is 16x9 enhanced. It features Dolby Digital 2.0 surround encoded sound. The quality of the trailer is very good indeed. I'm not normally all that interested in trailers but I liked this one. The voice over for this trailer refers to this film as being part of a trilogy. I don't agree as it doesn't follow on from the previous Stone Vietnam movies. Pedantic aren't I! This 'extra' is a single screen that simply lists the main cast and crew. Heaven and Earth was not a box office success which is a shame as it is a wonderful film. 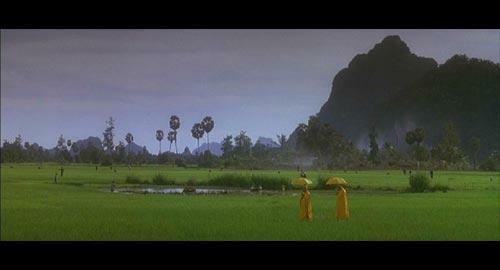 It features some powerful acting from Joan Chen, Haing Ngor, Tommy Lee Jones and Hiep Thi Le as Le Ly Hayslip. 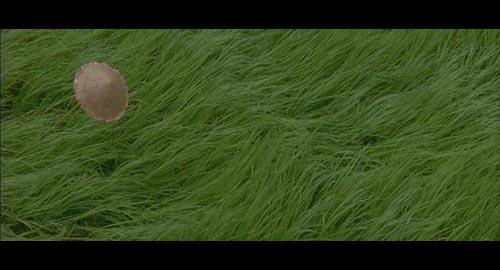 It features some superb cinematography and a lovely score. The story is both touching and disturbing all of which makes this an involving film that is well worth a look. As a DVD this is a quality package. It features excellent video and audio transfers and has a small number of good quality extras. "The harrowing tale of a peaceful family torn apart by war." "New York Stories is magnificant... ly adequate." "Ahhhh, champagne sci-fi! This box set is the DVD equivalent of something James Bond would be drinking!" "Woohoo! Babylon 5, Season 2 on DVD! Now this is quality sci-fi..."
"Ladies and gentlemen! Sit back and enjoy a concert performance by the legendary Mr. Ray Charles!" "Three significant events cause ripples of change to wash through the lives of six Los Angeles residents in what is a brilliant film from master writer/director Lawrence Kasdan."